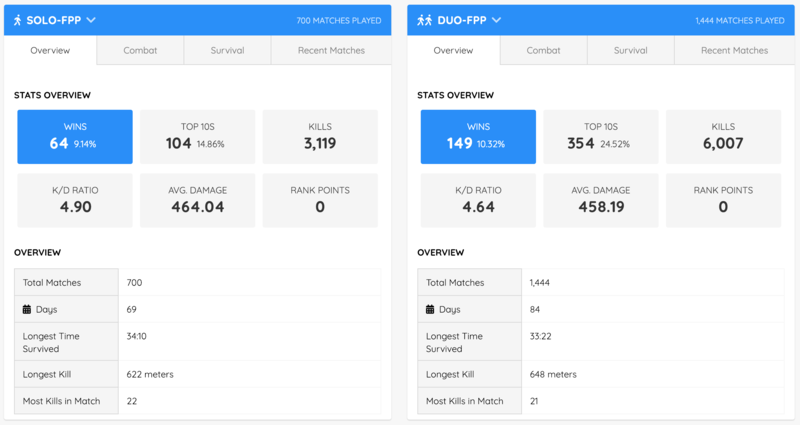 Stay on top of current season stats for you and your squad. We pull statistics straight from the PUBG servers so you know you're looking at current information. 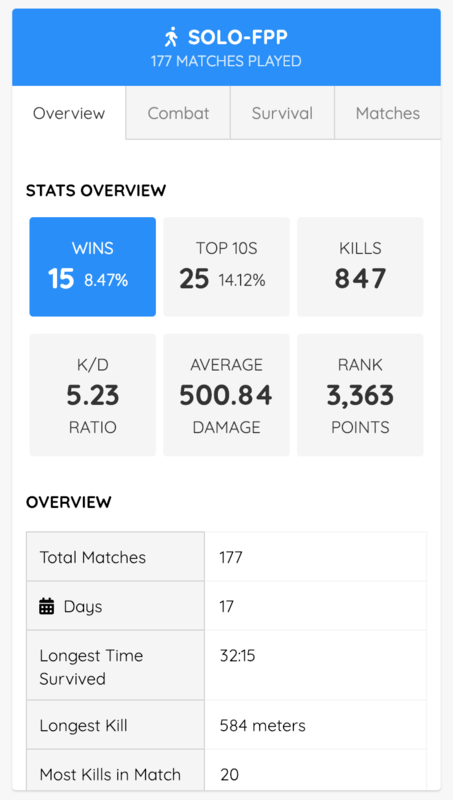 The season overview tab gives you a bird's eye look at how your season in PUBG is going. 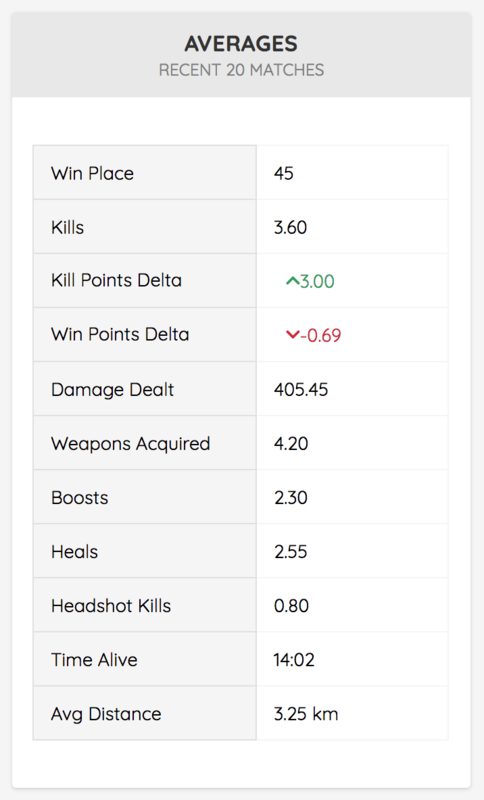 Get your kill to death ratio as well as average damage dealt per match.. Check out the last 20 matches for a specific game mode. 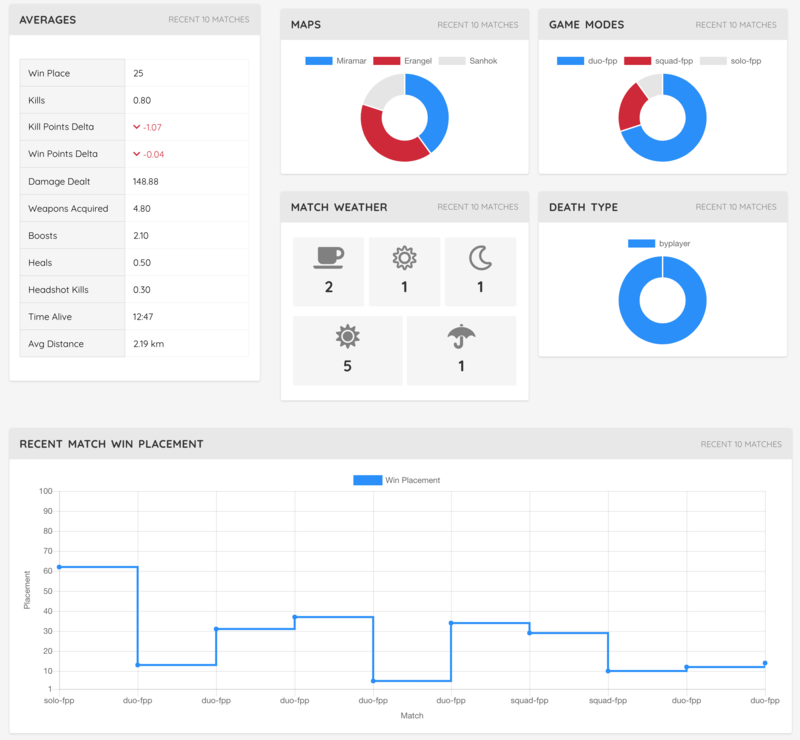 Get a quick glance at your matches or dive down for more detail. Get a match preview or list view of your most recent matches. Click in to see the match report. 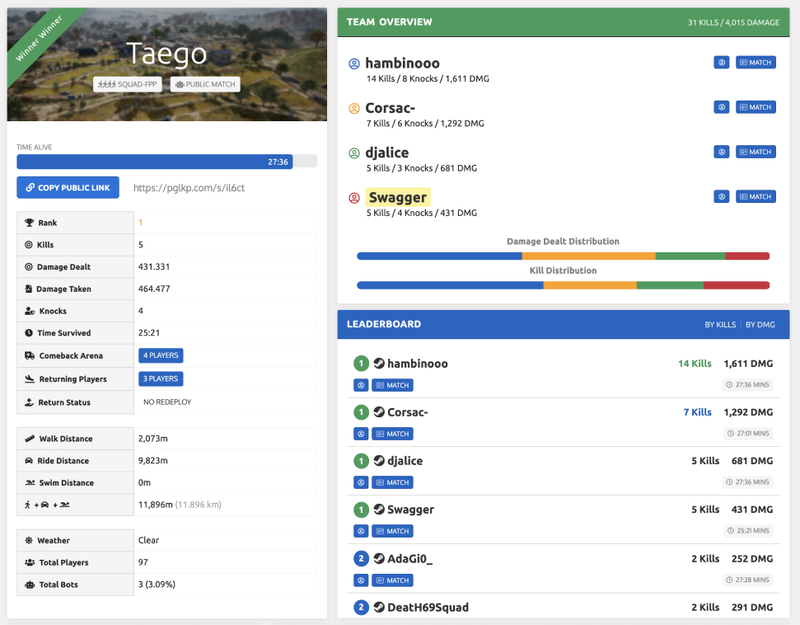 Keep track of your stats while you're playing or watching your favorite streamer. You can view all of your recent matches in a list view or a preview. When in preview mode you'll see many more details about the match so that you can find just the right one. For a much smaller, less detailed view you can select the list mode. 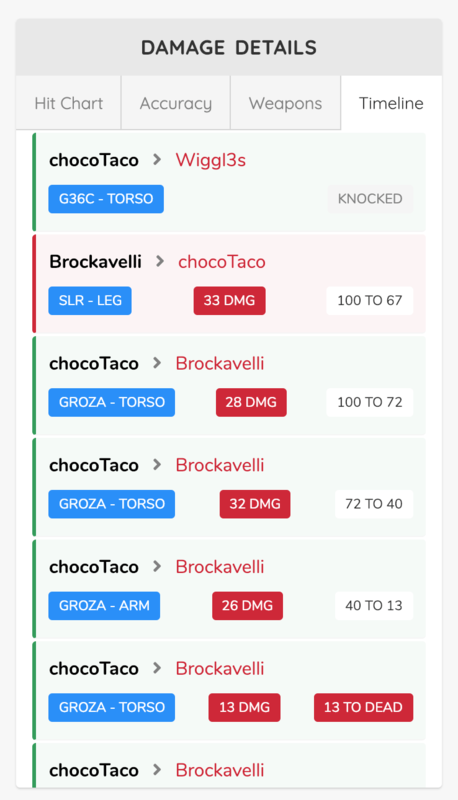 When in list mode you can see all of your recent matches in a compact table that lets you scan matches faster. Want to know how well you've done since you started playing? Here's your breakdown. Just like your season overview you'll get a lifetime game mode overview of your whole dinner career. Your career combat statistics compared with the current season can tell you a lot and give you good insite about how you're improving. It's one thing to get a high kill count, it's another to keep yourself in the game. 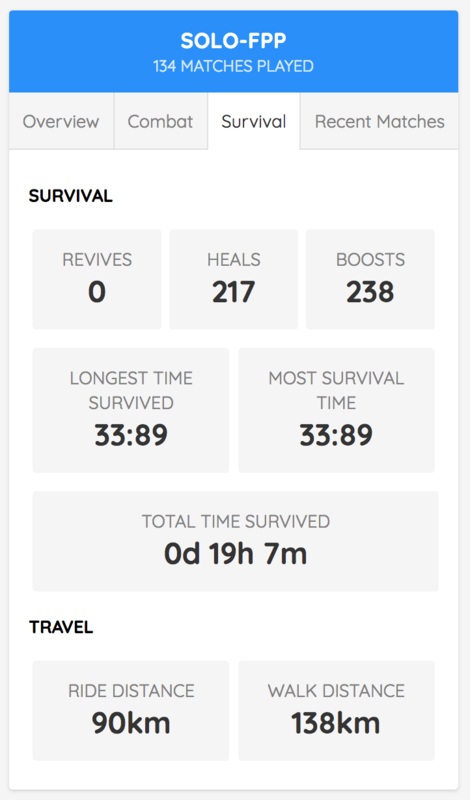 Get details about heals, boosts and travel distances here. 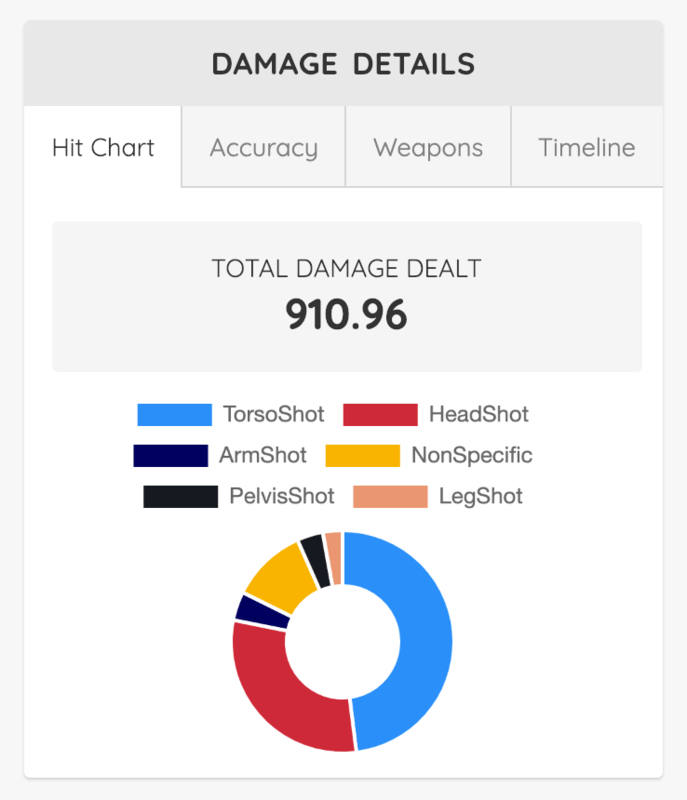 Get statistics on where your shots are going, how much damage they're doing, and what weapons are the most effective for the last 5 matches. 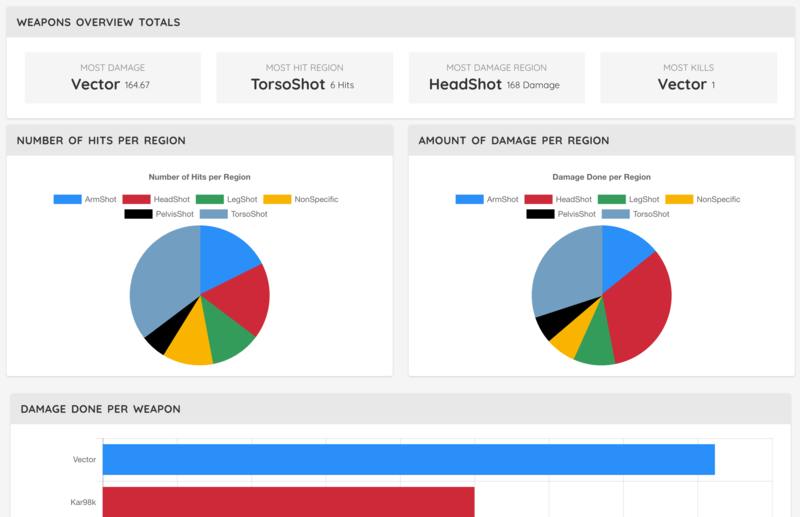 All of the weapons you used in the last 5 games are totalled and graphed to show you what weapons you are doing the most damage with. 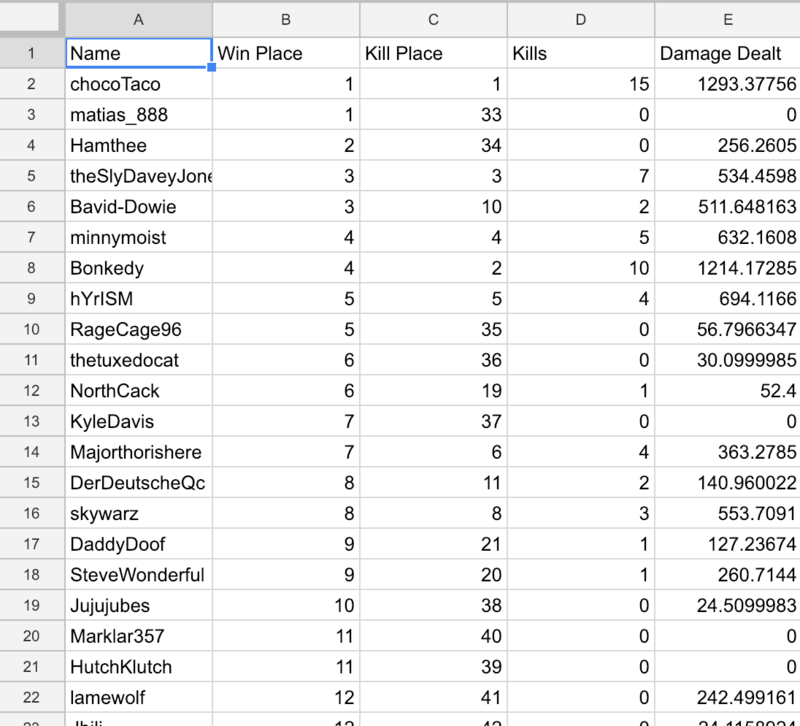 We graph all of the kills you had in the last 5 matches to show you which weapon is getting the job done. 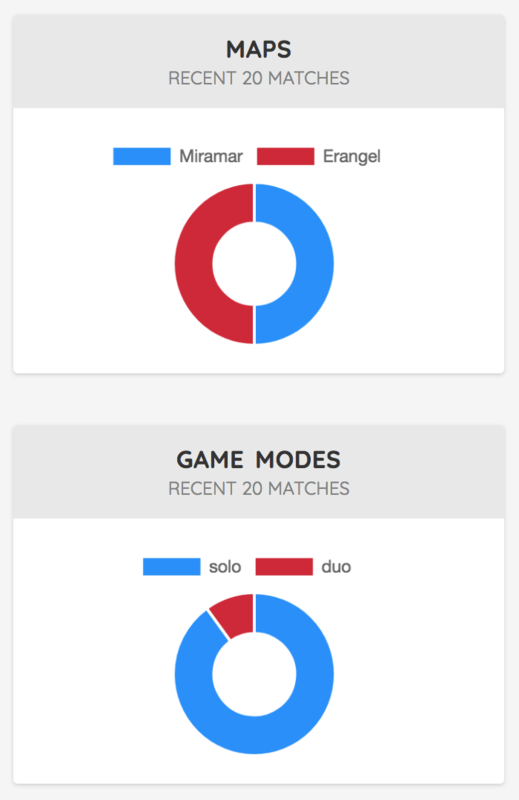 Get a bird's-eye-view look at how you or your friend (or your enemy) did during that match. All the basics. Ever wonder where your bullets go? Now you can find out. Quickly see just how much damage went to which hit region for the whole match. When you need to know exactly how much damage you did to a specific player. Get a list of all combat interactions you had in the match. Find out just how much damage you did per bullet. You can also see damage done to you. 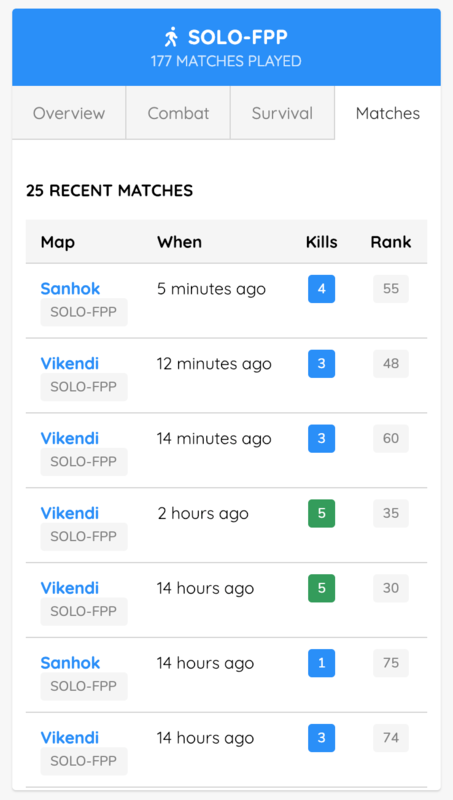 Get helpful information on your previous PUBG matches. We compile details from previous matches to give you insight about how you've been playing. Using information from some of your last matches we can give you averages to give you more of a sense of how you play each game over time. How many times have you thought "I only play Miramar..." or "Is there even more than one map?". Now you can know for sure. 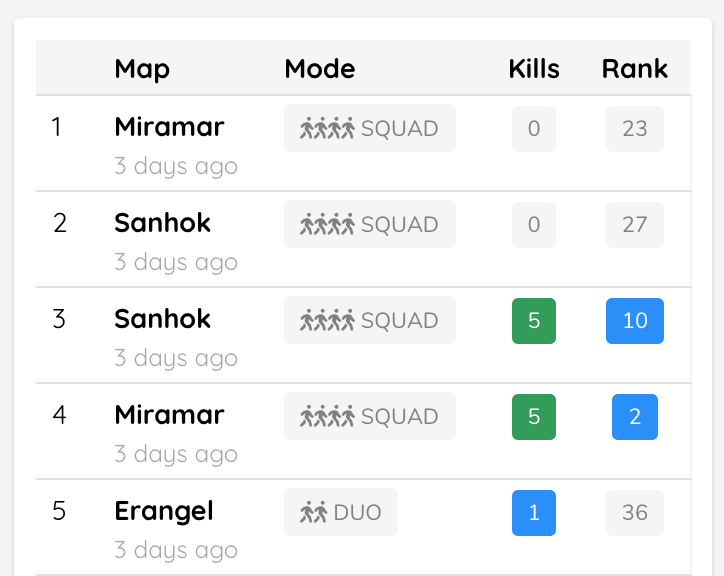 Keep track of your squad and favorite PUBG players. 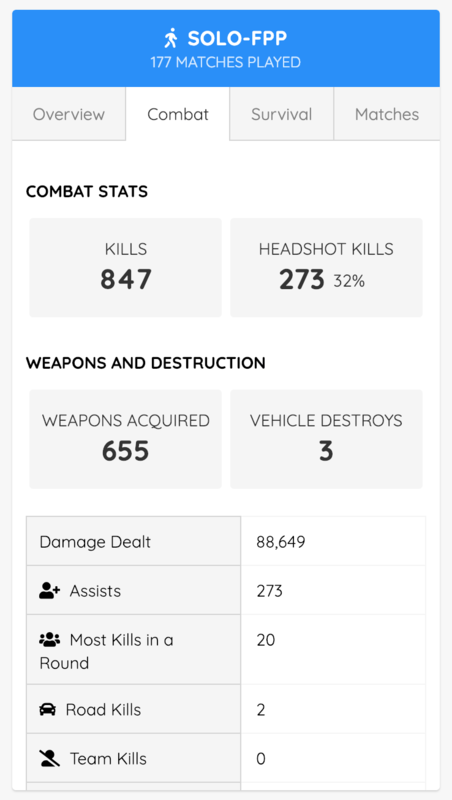 Easily star players to look up their stats, see their recent matches or casually rage-compare your recent stats. Now you can save that double-digit-dinner you were telling your squad about. Mark any match report as a favorite to save the match details and have it quickly available in the nav. 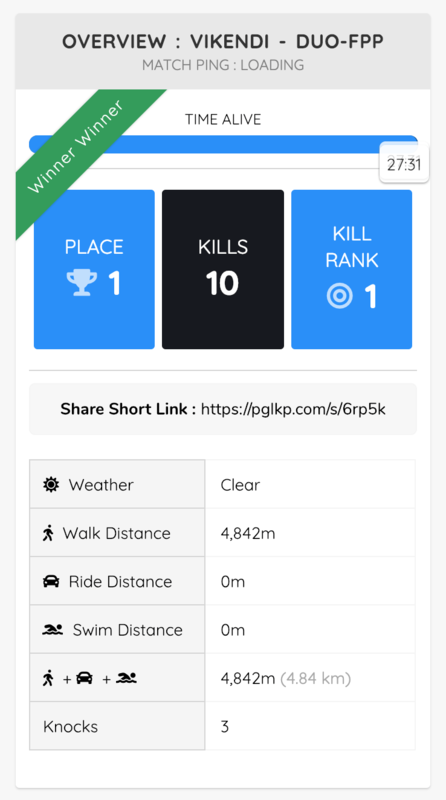 Want to get a visual of your kills in a match? No problem. 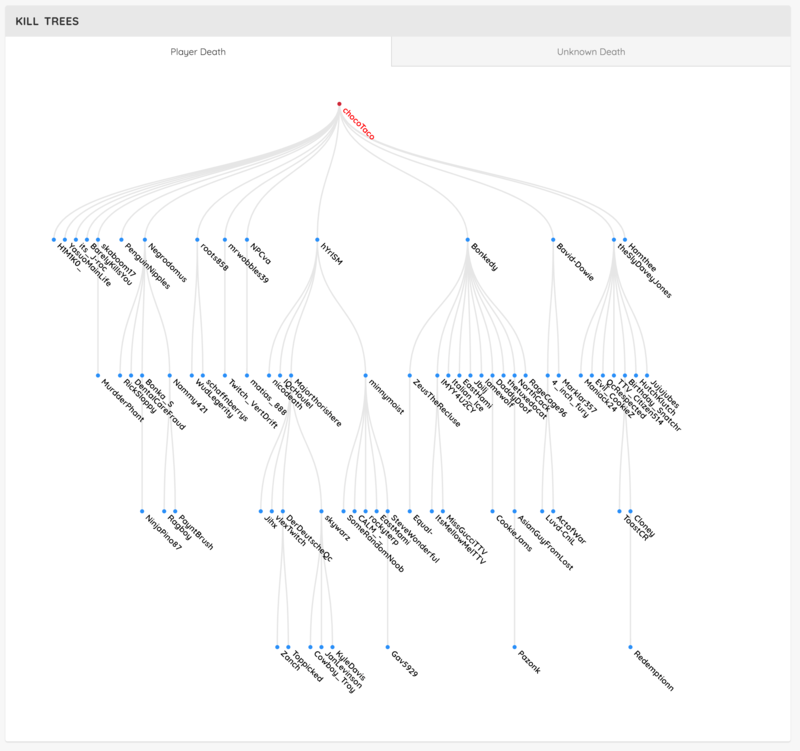 Every match comes with a visuall kill tree breakdown so you can see how each kill changed the outcome of the game. Are you a tournament organizer or just a number cruncher? You can export match data to a spreadsheet from any match report. Easily get the full breakdown of the match in a CSV file so you can do the math.